– Although you will not have that problem here because we are going to teach you to make authentic Mexican burritos. The beauty of the burritos is that they can be filled with almost any combination of ingredients that you can imagine. The vast majority of the times they have refried beans as base. Within the filling also some fresh ingredients are added like tomato, avocado, onion, etc. Now going into our recipe, this burrito has refried beans mixed with ground beef . Besides cheese, tomato, lettuce and more ingredients are added to this filling that give a fresh, delicious and super nutritious touch. 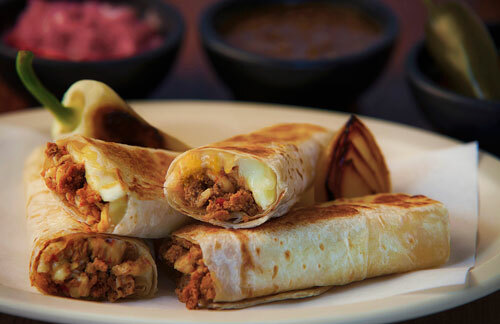 The burritos can be served at any hour of the day for breakfast , as appetizers or as main course. If you serve them as main course they can be accompanied with a mixed salad , Mexican rice and pot beans. Making the burritos is easy, just pay attention at the moment of folding them because it has its trick. The burritos are prepared with large flour tortillas, of approximately 10’’ - 12’’ in diameter. If you don’t get them prepare them yourself. In this recipe you will need a cheese that melts, we recommend the asadero cheese as it is perfect for the burritos. These burritos are prepared with refried beans, which you could buy them canned but its flavor is not that good... instead prepare them with us. The recipe is for 6 burritos. Cut into strips 1/4 of a lettuce, then set aside. Dice 1/2 onion and 2 tomatoes; then reserve. Heat in a frying pan over medium-high heat 2 tablespoons of olive oil. Put in the frying pan the onion dices that were cut and fry them for approximately 1 minute, until the onion looks a bit transparent; stir regularly. Incorporate in the frying pan 14.1 oz of ground beef and fry it for about 5 minutes, until it is medium cooked; stir regularly. 1 cup of Refried Beans. Mix the frying pan ingredients and fry them for about 2 minutes, until the beef is well cooked; stir regularly. Then set aside. Heat on a griddle over medium heat 1 extra-large flour tortilla for about 30 seconds per each side, until it is well heated. Some Grated Cheese that melts. Some dices of the Tomatoes that were cut. Some of the Lettuce strips that were cut. The cheese is placed in-between the warm tortilla and the warm filling so the heat of these 2 ingredients will melt the cheese. Fold the tortilla ends inwards and then roll the beef burrito; then serve it. Repeat the same procedure with other 5 flour tortillas. Suggestion: Accompany these burritos with your favorite salsa and you can also put them guacamole or Mexican cream. Variations: The burritos can also be prepared with chicken , grilled steak , chorizo , etc. Did you like the Beef Burritos? These flour tortillas are perfect to make burritos. Its size is very large, they are soft, fresh, they have a good flavor and they don’t break at the moment of folding. To heat such large tortillas you will need the “Lodge 14 inch Griddle". The tortillas will fit perfectly well and it also has very good heat retention. Start cutting like the professionals with the “Set of Victorinox Knives". The Victorinox knives have a perfect balance, very good grip, they are very sharp and you can sharp them as many times as you want.